Blog Quick Quotes: Introducing... Neva! I hail from Bend, Oregon where I live on a mini farm raising chickens, ducks, turkeys, Black Angus steer and breed German Shepherd puppies. I share all of this with my loving husband, two active athletic boys, and a daughter away at college in a nursing program. As a daughter of a talented crafter, I have crafted my entire life starting with egg carton Christmas ornaments at age 3 to hand sewing doll clothes as a preteen. As an adult, I continued to sew and dabbled in ceramics, fiber arts, stained glass, paper making, paste and marbling paper before becoming addicted to paper arts. Now I call myself a paper crafter, stamper, card maker, scrapbooker, and Bible Journaler who also dabbles in home décor, sewing, and gardening. As a high school science teacher by training, experimenting is second nature. I am excited to see what Quick Quotes products can create! Spring Showers 100 has lovely flowers on one side and a calming blue on the reverse. 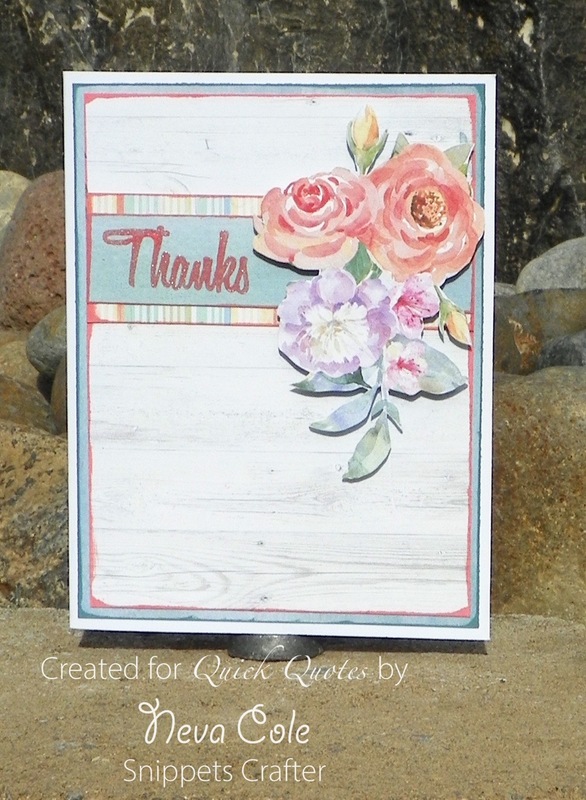 After fussy cutting a set of flowers from one side I used the center area that looks like white-washed boards for the front of the card. From the reverse of the same sheet I trimmed a backing sheet and the sentiment strip. I used Spring Showers 101 with multi-colored stripes to create the perfect accent to back the sentiment. 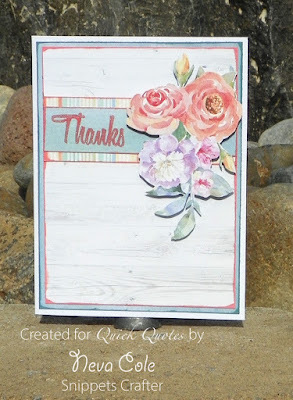 The sentiment was stamped in Tropical Punch PowderPuff Chalk Ink and then heat embossed with iridescent embossing powder. The top layers are edged in Tropical Punch, and the backing layer is edged in Capri Blue. The layers are adhered together and the focal flower image is adhered with foam adhesive. Viola, a clean simple card made in just a few minutes! 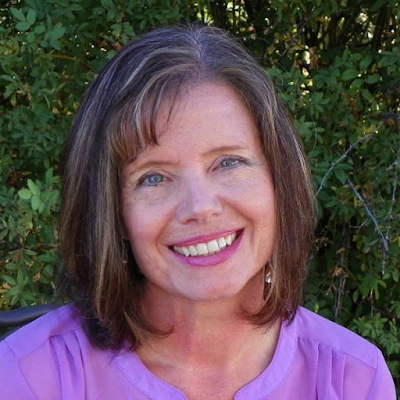 Neva blogs at http://snippetscrafter.blogspot.com/ , please give her a warm Quick Quotes welcome!